Well, here we are, at the final installment of “Hazel’s Diary”, the 2015 Kansas City Star Block-of-the-Month quilt. It’s exceptionally bittersweet because it’s the last installment of any Kansas City Star Block-of-the-Month quilt, now that there won’t be any more of them since the Star sold their book division. I’m sad about that, and way beyond honored that my quilt got to be the last one. Month 12’s installment chronicles Hazel’s last summer vacation with her family all together, and the planning leading up to her wedding to her high-school sweetheart on October 3, 1954. You can read about the family vacation beginning HERE. You can read about the wedding beginning HERE. Then follow the posts in chronological order to see more pictures and stories. 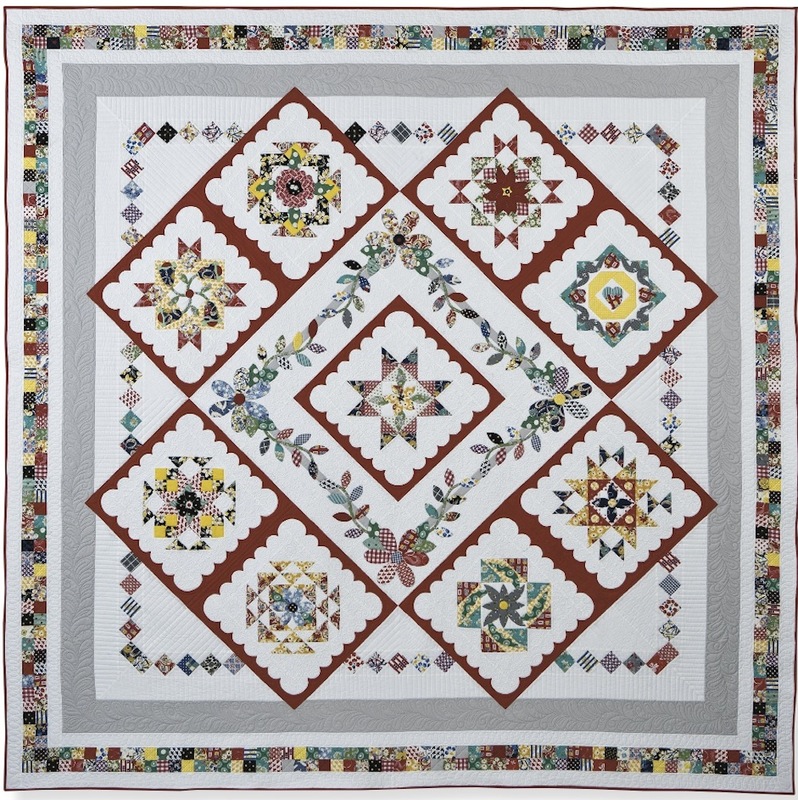 This month’s pattern is for the outer border that frames the entire quilt. 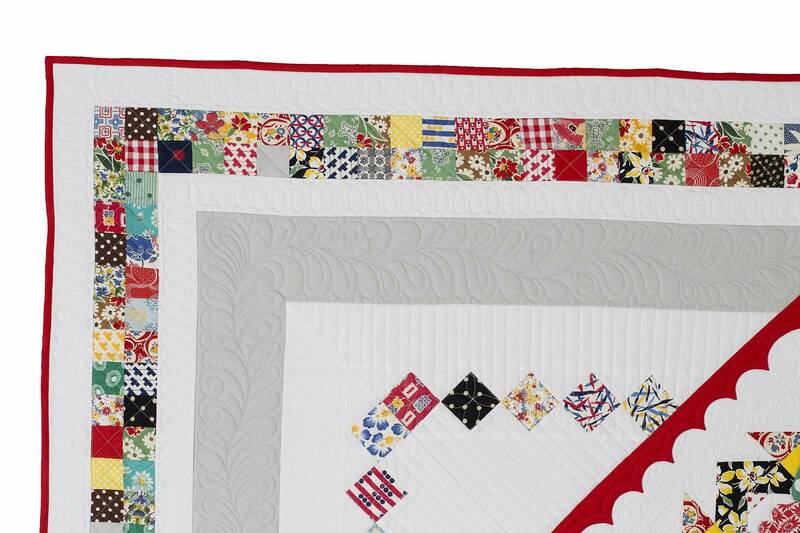 This scrappy border was designed to represent the large “ring” that holds it all together. Lots of little scrappy pieces symbolizing all the little bits and pieces that make up a life. Combined into a frame that completes the setting for all the larger pieces — memories, events, people, and love. I hope you’ve enjoyed the series this year, and if you’ve made your own version of a Hazel’s Diary quilt, I’d love to see it. Please send me pictures, or contact me if you need help with that. I’m planning to feature them on the blog, a few at a time. I love seeing all the different versions, and I know other people will enjoy them, too. You can read this month’s story HERE. You can download the full set of instructions from my Etsy shop HERE. If you’re where you can pick up the Sunday paper in person, this month’s House & Home section is a good one. There’s an interview with Jacquie Gering on the front, and the BOM installment inside — it’s chock full of quilty goodness this time! And stay tuned for more news as the book release date comes closer. They’ve announced that it will now be arriving in April, and I know work on it is moving forward, so I’m excited to get to hold one in my hands!